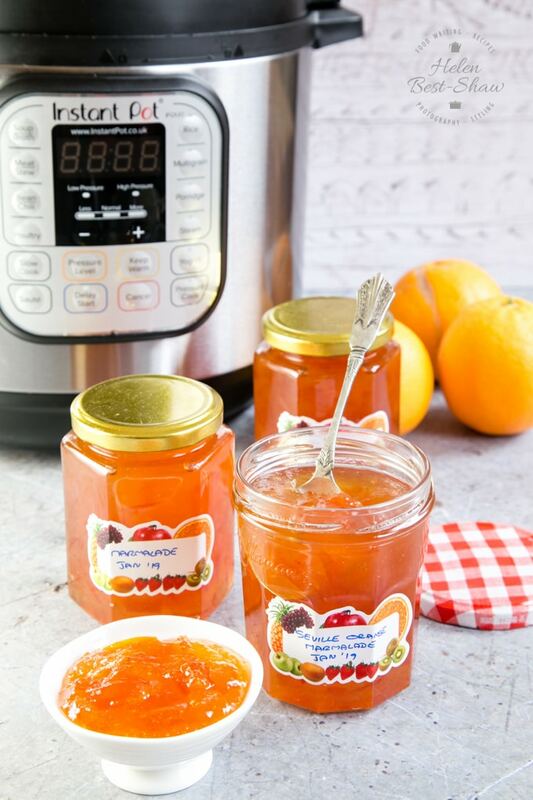 Make tasty marmalade in double quick time using an Instant Pot electric pressure cooker. 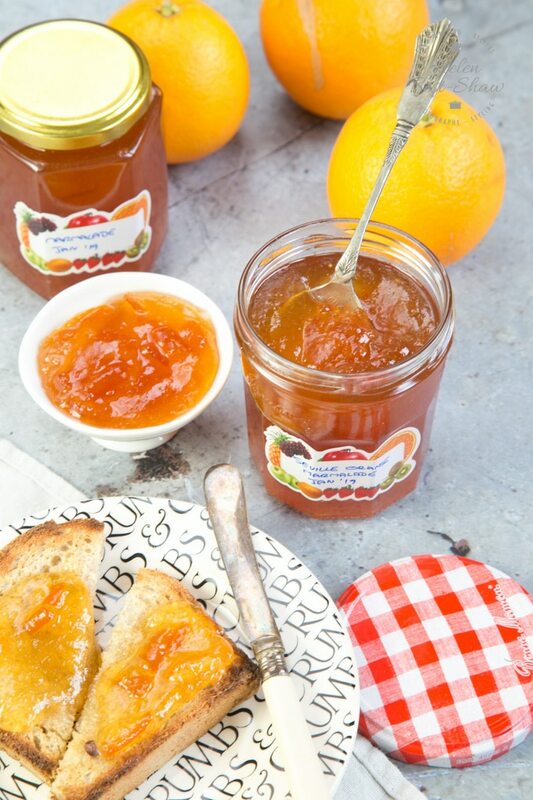 An easy recipe for all that gives a full flavoured marmalade in far less time than traditional recipes. Once you make homemade marmalade you will never buy store bought again. I do like a slice of toast thickly spread with butter and marmalade in the morning. A traditional treat, I especially like making my own; I find that a jar from the shop is usually over set and too much like jelly. I prefer a softer set, and by making my own, I can make a batch to exactly how I like it – not too sweet, not too jellyfied. 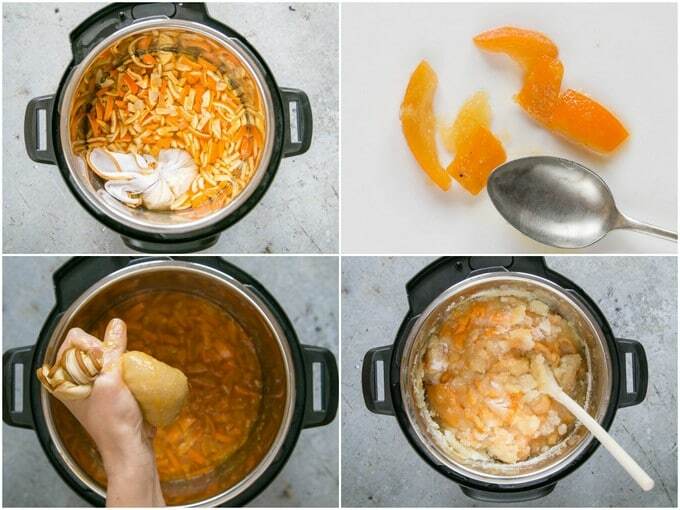 Making marmalade in an Instant Pot electric pressure cooker is a great way of saving time. Marmalade normally takes a while to make as the hard peel has to be cooked for at least a couple of hours to soften it and make it a pleasant texture to eat. By cooking the peel in an Instant Pot, this stage takes about a quarter of the time. Then I use the saute function of the pot to bring the sweetened juice and peel to a boil to set it. Once you start to make your own marmalade you will never buy it from the store again. Homemade marmalade improves dramatically on keeping, we recommend making a double batch the frist time you make it and storing in a cool dark cupboard for at least a year. How do I make Instant Pot Seville Orange Marmalade? How Long Does Homemade Marmalade Last? Step one -wash the oranges, then cut in half and juice. Keep the juice, peel, pips and pith. The easiest way to juice is with an electric juicer, but if you don’t have one then a traditional manual juicer or reamer will also work perfectly well. 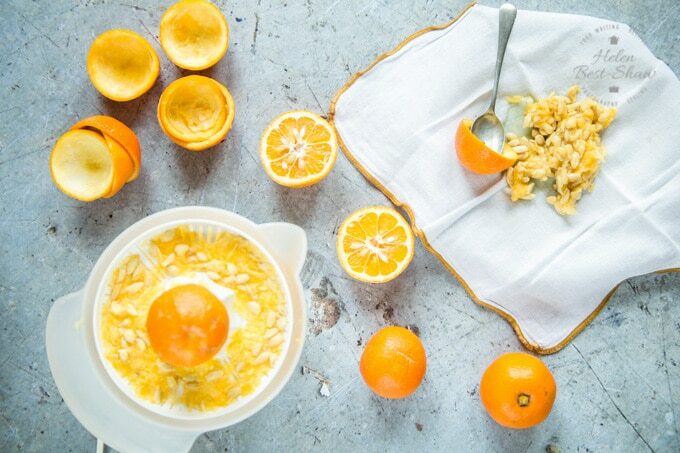 use a spoon to scoop the pith and seeds out of the juiced orange halves. Step two – slice the orange peel. One quick way of doing this is to cut each half peel into three, then stack the three strips on top of each other and cut across into narrow strips. Step three – measure the fruit juice into the Instant Pot. Make the liquid up to equal the original weight of oranges. i.e., I started with 1kg of oranges, so made the liquid up to1 litre. Step four – tie the pith and pips into a muslin cloth. Step five – add the lemon juice, sliced orange peel, and the pith to the liquid in the Instant Pot, close and set the dial to pressure cook. Pressure cook the mixture on high pressure for 15 minutes. Release the pressure once cooked and check that the peel is soft and will cut easily with a spoon. At this point you can cover and leave overnight and finish making your marmalade the next day. Step six – remove the bag of pips and squeeze out the pectin containing juice. Take care, as it will be very hot. Pressing the bag between two plates means is one way of doing it and not getting burnt. Step seven – add the sugar. It looks like a lot – especially if you have let the cooked peel cool, but don’t worry, it will all dissolve. The very high bitterness of the Seville oranges needs this much sugar to make a tasty marmalade. Pop the jars and lids into a low oven to warm and sterilize. Step eight– set the Instant Pot onto the low sauté setting. Stir the mixture as the sugar dissolves. Taste the marmalade to check sweetness, and adjust as necessary. Step nine – once the sugar has dissolved, turn the Instant Pot up to the high sauté setting, and keep stirring until you have reached the setting point. I use a probe thermometer to monitor the temperature, then test with the wrinkle test. With experience you will be able to see when homemade preserves are at setting point as the bubbles will change. Step ten – let the Instant Pot Seville orange marmalade cool for about 10 minutes, and then transfer to the warmed jam jars. By letting it cool slightly the jelly will thicken just enough to stop the peel rising to the top. Fit the lids and allow to cool completely. The temperature test. Really accurate electronic jam thermometers are readily available, and not expensive. They are much easier to read than traditional thermometers. Heat the marmalade to the 105°C and once it’s that hot it’s ready. The wrinkle test. Place a couple of side plates in the freezer before you add the sugar. Once the marmalade is boiling, start testing by placing some on the plate. Allow it to cool and when you push your finger through the marmalade, if it’s setting you’ll see it wrinkle up a little ahead of your finger. This technique takes a bit of practice. The flake test. Take a spoonful of marmalade from the pan and turn it vertically to tip it out. If the marmalade runs off quickly and completely it hasn’t set. If, however a little remains on the spoon in a sort of wide drip that doesn’t fall, then the marmalade is ready. Again, this works best with some practice. Water – Add water to the juice until you have a total volume of liquid equaling the weight of the unpeeled oranges. E.g. for 1kg of unpeeled oranges, we got 400ml of juice. We added 600ml of water to make 1 litre in total. Lemon juice – Add the juice of half a lemon per 250g (about 3) oranges. Sugar – Seville oranges are very bitter, so they need a lot more sugar than other jams – about twice as much, in fact. I double the weight of oranges for the weight of sugar. Taste the mixture, and add more sugar if needed, but take care, as it will be hot! Making marmalade in the Instant Pot is so much faster than not using a pressure cooker. The peel softens in about 15 minutes, rather than a couple of hours. For a grown up marmalade, stir 4 tablespoons of whisky into the marmalade just before filling the jars. If you don’t have time to do it all, you can peel and cook the oranges and let them cool before adding the sugar and cooking. No Seville oranges to make marmalade from? Just use your choice of citrus fruit – regular oranges, blood oranges, grapefruit or lemons, or why not try a mixture? For regular citrus fruit use about the same weight as sugar to fruit. No Instant Pot? Don’t worry! This recipe can easily be made using a large saucepan or preserving pan. The pan should be large enough so that it’s only about half full when all the ingredients have been added. Add more water for when you cook the peel – make the liquid up to twice the original weight of oranges. E.g., for 1kg of oranges, add water to the juice until you have 2 litres of liquid. Then simmer the peel, with the pith and pips tied into a muslin bag, for about 2 hours, until the peel is soft and can be cut with a spoon. The liquid will reduce down to about 1 litre; the same as we use in our pressure cooker recipe. 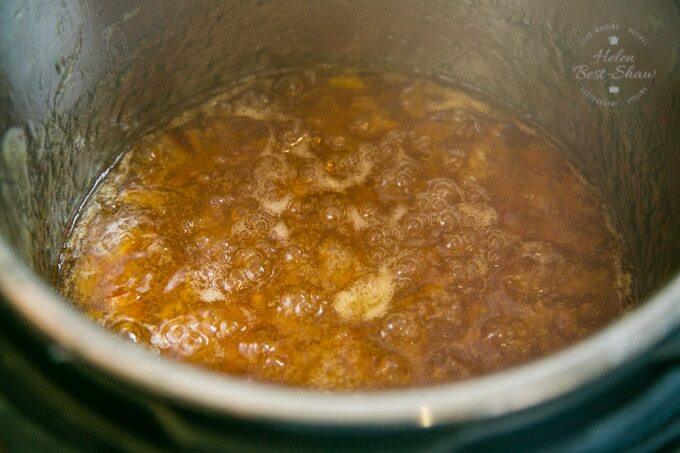 Then add the sugar and boil until the marmalade sets, as detailed in the recipe. Provided you have sterilized the jars properly and they have sealed properly a well made marmalade contains enough sugar to preserve it for many years. As it ages the marmalade darkens and the flavours deepen. We are currently enjoying a 8 year old jar, and usually keep our homemade marmalade for a year before we eat it. 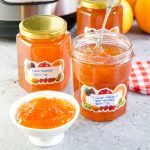 If you try this Instant Pot Seville Orange Marmalade (Electric Pressure Cooker) please tag #FussFreeFlavours on Instagram or Twitter. It is amazing for me when for me when you make one of my recipes and I really do love to see them. You can also share it on my Facebook page. Please pin this recipe to Pinterest too! Thanks for reading Fuss Free Flavours! An Instant Pot or other electric pressure cooker dramatically shortens the time it takes to make a batch of delicious home made marmalade. This recipe gives full, easy to follow instructions including not using an Instant Pot. Wash the oranges, then cut in half and juice. Keep the juice, peel and pips and pith. The easiest way to do this is with an electric juicer, but if you don't have one then a traditional juicer or reamer will also work perfectly well. Slice the orange peel into strips. 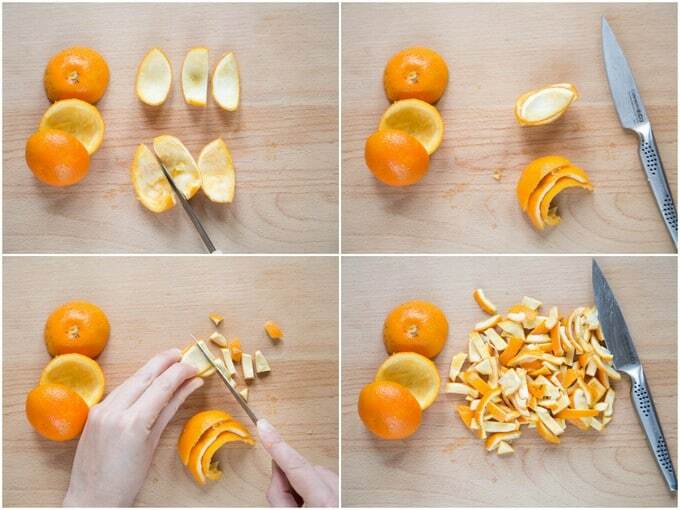 The easiest way to do this is by cutting each half peel into three . Then stack the three strips on top of each other and cut across into narrow strips. Measure the fruit juice into the Instant Pot. Make the liquid up to equal the original weight of oranges. I.e., I started with 1kg of oranges, so made the liquid up to 1 litre. 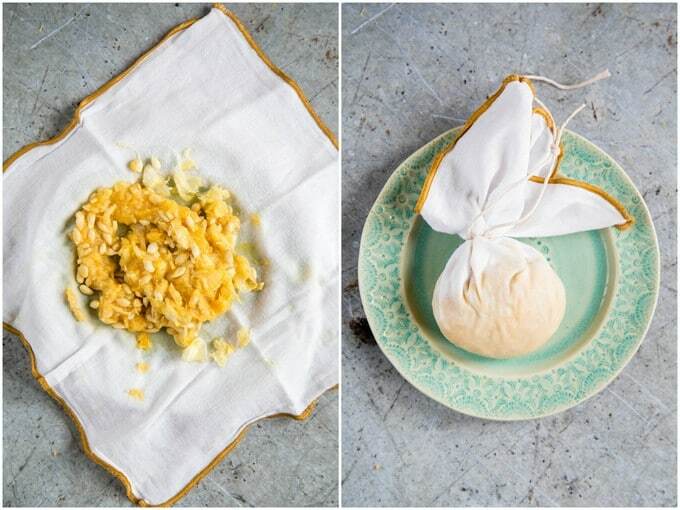 Add the lemon juice, sliced o peel, and the pith and juice tied into a muslin cloth. Pressure cook the mixture on high pressure for 15 minutes. Release the pressure once cooked and check that the peel is soft and will cut easily with a spoon. Remove the bag of pips and squeeze out the juice. One easy way of doing this is by pressing the bag between two plates. Add the sugar. It looks like a lot of sugar, but don't worry, it will all dissolve. The very high bitterness of the Seville oranges needs this much sugar to make a tasty marmalade. Set the instant pot onto the low sauté setting. Stir the mixture as the sugar dissolves. Once the sugar has dissolved, turn the Instant Pot up to the high saute setting, and keep stirring until you have reached the setting point. Check for a set by either using a preserving thermometer, the plate method or the flake method. Testing for setting point. Use one of these three methods. The temperature test. Really accurate electronic jam thermometers are readily available, and not expensive. They are much easier to read than traditional thermometers. Heat the marmalade to the 105°C and once it's that hot it should at at setting point. I always test with a wrinkle test. The wrinkle test. Place a couple of side plates in the freezer before you add the sugar. Once the marmalade is boiling, start testing by placing some on the plate. Allow it to cool and when you push your finger through the marmalade, if it's setting you'll see it wrinkle up a little ahead of your finger. This technique takes a bit of practice. The flake test. Take a spoonful of marmalade from the pan and turn it vertically to tip it out. If the marmalade runs off quickly and completely it hasn't set. If, however a little remains on the spoon in a sort of wide drip that doesn't fall, then the marmalade is ready. Again, this works best with some practice. Let the Instant Pot Seville orange marmalade cool for about 10 minutes, and then transfer to the warmed jam jars. Fit the lids and allow to cool completely. Juice, peel and cut the peel as in the recipe. Double the total amount of liquid. I.e., if using 1kg of oranges, add enough water to the juice to make it up to a total of 2 litres of liquid. Then simmer the peel in the liquid for 2 hours, to cook the peel and make it soft. Then add sugar and and continue with the recipe.